Apple rumors are often so much digital smoke blowing in the breeze, but a new crop have some real weight behind them and may be giving us clues about Apple’s upcoming new hardware. The iPad Mini: It’s Back! This rumor has come and gone and come again, driven by two seemingly opposing forces: The army of smaller, more portable 7-inch Android tablets and, a while ago, Steve Jobs’s insistence that 7-inch tablets are a bad idea. Now there’s new incentive for Apple to address this market thanks to Google’s Nexus 7 tablet, Amazon’s Kindle Fire (and rumored refresh) and Microsoft’s attempt to grab some of the iPad’s market share with Surface. And Steve’s no longer with us, although of course he was also famous for saying one thing and then doing the opposite some time later. Which is why we should pay attention when the Wall Street Journal, often suspected to be an official “leaky channel” for Apple in order to manage expectations, says that mass production of a new iPad variant with a display “smaller than 8 inches” is going to start in September. The news comes via sources inside the system, and mentions Apple’s supply chain. It seems like a clever idea–as we’ve long argued–because the tablet would be more portable, could sell at a significantly reduced price point while still being highly profitable, leverage Apple’s three years of iPad expertise and the design model of the still-in-production iPad 2 in particular, and augment rather than fragment Apple’s tablet dominance. The “less than” 8-inch screen would let Apple distinguish itself from the hoard of 7-inch Androids, and the cheaper price may help it sell in markets like China where Apple is just beginning to tap a vast revenue stream. 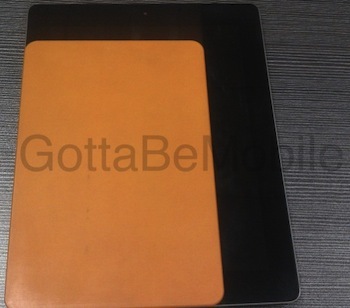 Even more recently website GottaBeMobile has posted photos it says are early “engineering samples” of the design for the iPad mini. Essentially these are plastic replicas of the final device’s shape so that designers can manhandle the object to sense size and portability, and so that third-party manufacturers can put together cases and peripherals. The device looks thinner than the current iPad, and seems to have the same smaller dock connector rumored for the iPhone for 2012. It also appears to have ever-so-slightly different proportions, which could be an indicator it has a 16:9 widescreen. Ultimately this is just a lump of plastic, and could even be a non-Apple fake so we’re dubious about its provenance…although any iPad mini we do see may actually look like it. Hot on the tail of that rumor came another, suggesting that the new iPad will be partly machined in China, but actually assembled in Foxconn’s new production facility in Brazil that’s already busily churning out iPhones. Presumably the iPhone production was partly an experiment to see if the Brazilian factory could be quickly ramped up to meet Apple’s high standards. It’s plausible, and would let Apple and Foxconn sidestep some of the possibly over-zealous criticism of their operation in China. It won’t address the “made in USA” argument that some critics are voicing and that Google is quietly pushing, but it’s certainly a start. iPhone 4S Production Curtailed Early? Meanwhile, sources inside Apple’s supply chain are saying that the company is already scaling back production of the iPhone 4S. You may see misguided commentary on this matter, suggesting the product is not selling well and this is an Apple slip-up, but that’s almost certainly the opposite. Apple controls its supply chain with an iron fist, and knows that with more public attention thrown on its upcoming iPhone refresh then sales of the previous unit may tail off, so why produce more units? A scale-back will also allow component suppliers and manufacturer partners room to begin configuring their production lines for the new iPhone for 2012 enough ahead of time that any wrinkles can be ironed out. But Apple is said to maintain a mere five days of inventory in its very short chips-to-ships production process, and a tail-off in June seems like a very early move for a long-supposed October debut for the iPhone for 2012. Which may actually mean Apple is bringing the new phone out a little earlier, perhaps in September. That makes sense, given 2011’s iPhone 4S was a relatively small-scale upgrade on the previous phone which would’ve given more time for engineers to refine the specs and design of its successor. And it leaves October free for iPad mini news. Meanwhile another WSJ article, with curious timing, steps on the notion that Apple will actually put NFC technology into the next iPhone. It’s suggested that NFC payment tech really was on the cards for a long time, but that a fairly late executive-level decision was made to not go ahead because of battery consumption issues and worries that consumers weren’t adopting the systems. This stance makes some sense, because in speaking with many companies pushing for advanced mobile payment solutions Fast Company has heard many voices say they’re waiting for true technical standards to emerge. But battery consumption is a strange problem to note, because it doesn’t seem to have hampered many of Apple’s rivals–Samsung in particular. And an NFC comms system is actually low-power–it’s actually deliberately designed to be so, else the NFC chips embedded in things like train tickets simply wouldn’t work. Meanwhile many countries outside the U.S. are pressing ahead with NFC payment adoption, with the U.K. as a great example, and more than 60% of iPhones are sold overseas. If there’s any official Apple input to this rumor, it may be a case of smoke-and-mirrors. Apple may be suggesting this story because it’s actually pressing ahead with its own separate payment system that circumvents other providers like payment device makers, the phone networks by not using NFC at all–an expansion of its already clever EasyPay solution, perhaps, with some added PassBook goodness. Patently Apple has uncovered a newly granted Apple patent that seems to contain the core of its new PassBook application, a simplified digital wallet. But the patent goes the whole way and includes mechanisms for using NFC or a similar tech for actually identifying the user when checking in and paying for flights, hotels, car rentals, trains, and so on. So perhaps Apple really does have this tech on the way. 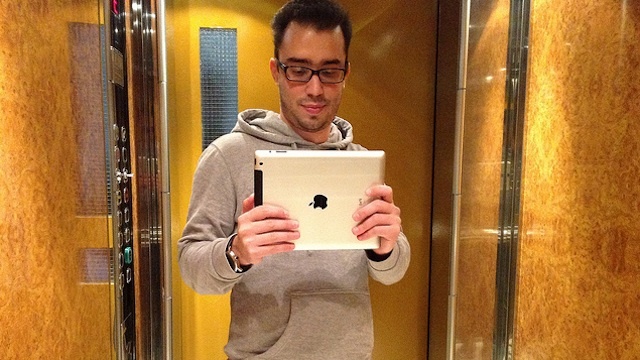 According to inside sources speaking to the Times, Apple really does have an iPad “mini” on the way. It’ll sport a 7.85-inch display and sell for “significantly less” than the iPad 3’s entry price of $499, which we presume means it’ll also undercut the $399 iPad 2, still on sale to seduce customers who want to spend less. More iPhone “5” front glass pieces have leaked out from Apple’s supply partners, this time to ApplePro.com. They tally with earlier leaks in that they show a new position for the front-facing camera above the earpiece and that they have space for a 4-inch widescreen display–bigger and taller than the current iPhone’s. So many leaks have now happened that it’s beginning to look pretty certain this is the design Apple really is going with. According to different sources, Apple’s suppliers are already ramping up production of the next iPhone in order to build up enough inventory for a launch, an event that’s previously seen Apple sell millions of devices in the first week in a long list of international launch nations. This ramp-up seems earlier than expected, and it’s now suggested the iPhone will be released in September. Website KnowYourMobile has gone one step further, and says that an insider revealed an iPhone reveal event is due to happen Tuesday August 7th. Since in recent years Apple has made the new iPhone available almost immediately after the reveal, this may even suggest an August launch window. We’re taking this with a pinch of salt, because this really does seem like an early launch window with odd timing–August is a traditional holiday month in many nations, which seems like a bad time to launch a new product. But it does indeed sound like Apple is gearing up for something sooner rather than later.